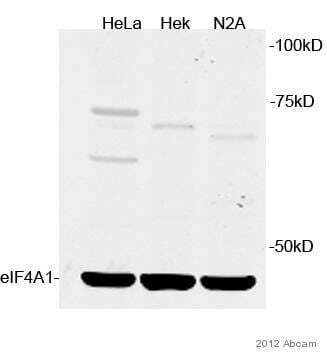 I would like to have informations about your eIF4A1 antibody (ab 31217). 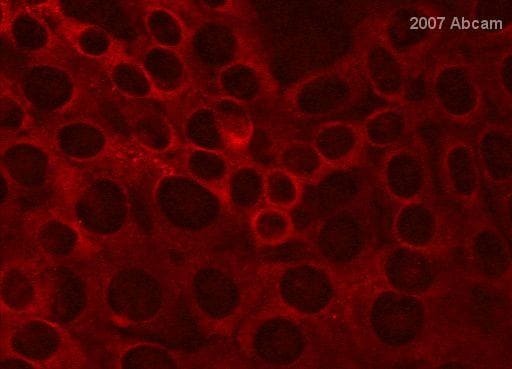 I use the sea urchin embryos for my analysis. 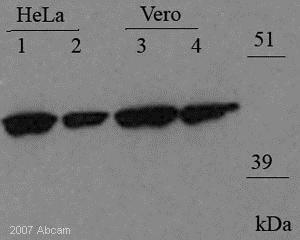 I would like to know the sequence similarity and identity between the sea urchin eIF4A and the peptide that you used to produce this antibody. I can give you the sea urchin eIF4A sequence: MSYIDDEQANSQVTKPGPGPGAGPDENGRQAEDQGIVTVEDGIIDTNWDQVVENFDDMGLRESLLRGIYAYGFEKPSAIQQRAILPCCEGKDVIAQAQSGTGKTATFAISILQQLNVEEKQCQALVLAPTRELAQQIHKVIVALGDYLEVKCHPCIGGTNVRDDMNLLSEGVQVIVGTPGRVFDMLKRKVLSPFKIRMFVLDEADEMLSRGFKDQIYDVFSWLPSEVQVVLLSATMPVDVLEVTKKFMRDPIRILVKKEELSLDGIKQFYIAVEKEASLTGNGDERDTKRERGGWESIFIEDGLLLQSKSEVFEHGDMDQKERDKIMKEFRTGSSRVLICTDLLARGIDVQQVSLVINYDLPTNRENYIHRIGRGGRFGRKGVAINFVPDEDKRNLRDIQQFYNTQVDEMPSNVADLV Can you tell me your opinion about the probability of cross reaction in sea urchin? Thank you. Thank you for your enquiry. 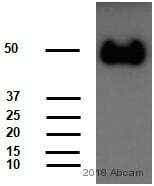 Unfortunately it appears there is no significant homology between the immunogen and the seuence you provided. 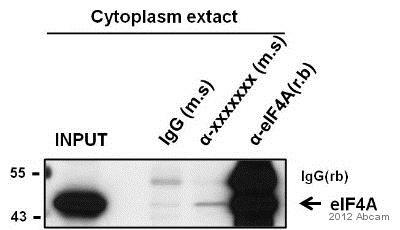 It is unlikely this antibody will cross-react with sea urchin. I hope this information helps, please do not hesitate to contact us if you need any more advice or information.